The protagonist, Thomas, a 16-year-old boy, wakes up inside an underground service elevator with no memory of his identity. A group of male youths greet him in a large grassy area called the Glade that is enclosed by tall, stone walls. Every month, a new boy and supplies arrive in the elevator. The boys, called Gladers, have formed a rudimentary society with each assuming specialized tasks. Alby, their leader and the first to arrive in the Glade, says every boy eventually recalls his name, but none remember their past. The boy learns that a vast Maze surrounding the Glade may provide the only way out. During the day, designated Runners search the Maze for an escape route, returning before nightfall when the entrance closes. No one has ever survived a night inside the Maze. While in a competition with Gally, the boy suddenly remembers his name is Thomas. Later, Thomas is attacked by Ben, a Runner delirious from being stung by a Griever – deadly techno-organic creatures that roam the Maze at night. Ben is forced into the Maze and left to die as there is no cure for what the Griever infected him with. Minho, the lead Runner, and Alby later retrace Ben's steps inside the Maze. Minho reappears at dusk dragging Alby, who was stung, but they are unable to reach the closing entrance in time. Thomas spontaneously runs into the Maze to help but all three are trapped. 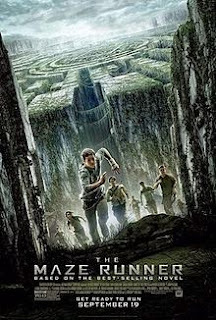 During the night in the Maze, Thomas and Minho tie Alby up high on the Maze wall to hide him from the Grievers, but Minho abandons Thomas when a Griever emerges from the center of the Maze. Thomas slides under the Maze wall, managing to hide from the Griever. Later, Thomas finds Minho and his actions during the night keeps them alive, and he kills a Griever by tricking it into a narrow, closing passageway thus causing it to be crushed, making him the first to ever survive the night and kill a Griever. To the other boys' astonishment, they return the next morning. The next morning, the first-ever girl arrives in the elevator. She apparently recognizes Thomas though he cannot remember her. A note says she is the last one being sent. Thomas, Minho and several volunteers enter the Maze. They locate the Griever corpse and remove a beeping mechanical device from inside it. Gally claims Thomas has jeopardized the fragile peace between the Gladers and the Grievers and wants him punished, but Newt, the group's second-in-command, instead designates Thomas a Runner. Minho shows Thomas a scale model of the Maze he has built, based on his three years of exploration. The Maze's numbered sections open and close in a regular sequence that might be a code. The device is numbered to correspond to a certain section within the Maze. With the mechanical device, they may be able to find an escape route.